Since I almost exclusively play online through Roll20 these days I want to share my typical prep steps for a game that does not have native Roll20 support. I often play smaller or indie games that lack any official support. The assumption is you have decided on a game to play and have some players in the pipe to join. You can click on all images in the post to see a larger version. 1. Create your game of course. This one is obvious of course, head to Roll20 and create your Game there. 2. Create and assign a cover Image and some intro text. This is going to be the first thing the players see. I usually choose the cover of the rule book or an inspiration picture that invokes what the game is about. 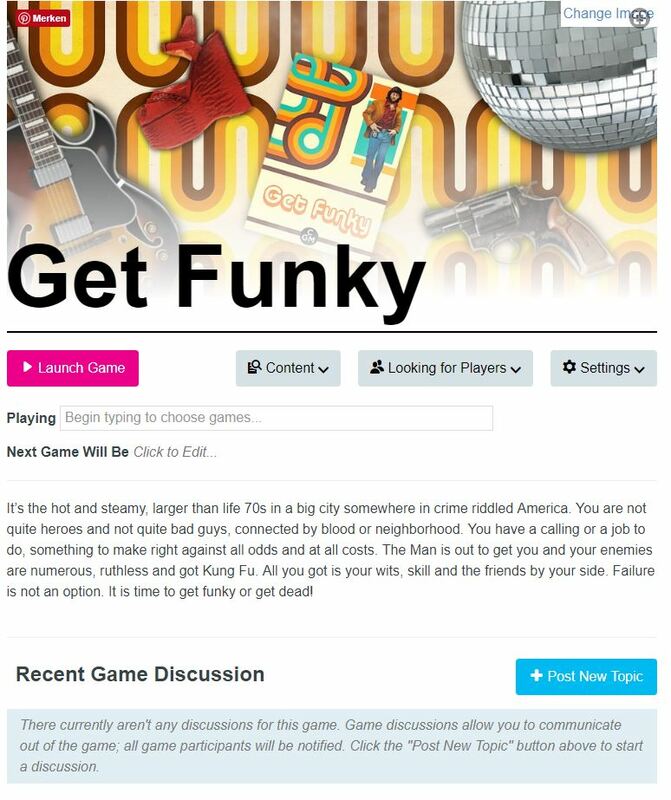 Or create one myself as I did in this case for my game Get Funky. You can immediately tell what kind of game this is going to be. 3. Set up dice macros. 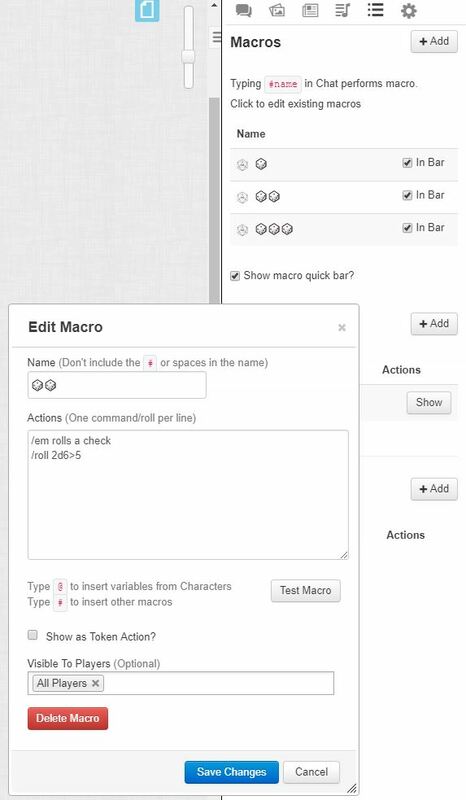 Games that do not have sheet support can usually be accommodate with the built in macro engine of Roll20. I tend to set up macros for the main rolls required. Even if the system just uses 2d6 with modifiers. It saves a large amount of time during the game once everyone is familiar on how to use them. While it can look intimidating, it is not hard to learn basic macros and the Roll20 macro guide and dice reference is good. There are also some premade macros here, they can help you to learn or already give you what you need. I very rarely need the macro guide, the dice reference alone is usually enough for most of my needs. You can`t do overly fancy stuff with this but you should be OK for most systems. Some more advanced dice mechanics require the API and a programmers help. Don`t be shy to ask in the forums, there are a bunch of super helpful people around that can help you create an API script for more complex roll mechanisms if really needed. I tend to do this in advance as I can already add in relevant information for the players here. I can`t assign them to players yet, but that is not a problem. I prefer to do it all before so I have more time instead of when the players are logged in. Hand-made fancy sheets inside Roll20 is not something I usually do, as that is too much work for me. I still like to have characters there so players can choose their characters identity for chat and rolling. I can also put background information and Links on the sheets and have tokens and character images within Roll20 if I want. I also create a character for my own so if I roll or chat I am not identified as myself but whatever GM like character I want to have, complete with image. I feel it is good practice to give the players a place in Roll20 where they can take down notes if needed. So I do that next. Just add a Handout and have it available in all players journals and editable by everyone. I usually give it a journal looking image as well. I usually like to get a bit creative with fonts and colours here to set up the style and mood of the game. Since I am a visual person I usually start by deciding on a primary colour for the game and then create a palette of fitting colours for the character sheets here https://coolors.co/. Propably overdoing it, but hey, it is fun! This also helps me for the splash page. There are a ton of fonts to choose from as well and with just a bit of work you can make something nice and fitting for the game. If necessary I also add in formulas here as I tend to track most information on the sheet instead of in Roll20 itself. More complex systems don`t lend themselves for character creation on game day if there are only 2-6 hours of play time total. If character creation takes longer than 30 minutes I usually create at least one pre-gen per player. Some players still prefer to create their own beforehand and that is fine too. I usually communicate in the invitation what the plan is and make sure we stick to it. If someone shows up without a character and wants to make on there while I clearly stated they either do it beforehand or get a pregen they get the pregen or not play at all. I find it is very important to establish certain group rules right from the get go. It is unfair to all the other players to have to wait around for one guy to get his character done. While we are not playing quiet yet I ask everyone to quickly log into the game at a time before the scheduled game. This way I can assign characters and handouts etc. to players. This sometimes works, sometimes it doesn’t. But every player you can assign stuff to before the game actually starts saves time. Before game day I assign either one of the blank characters or a pre-gen to each player. 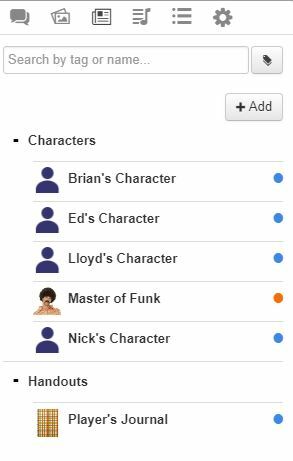 At the bare minimum the character sheet contains a link to the outside google sheet we are using. This step usually takes the longest but is also one of the most fun for me. The splash page is the page the players will be looking at while we are not on a battle map. I try to make it look nice, with a strong theme for the game. GIMP is my tool of choice to create the pieces. Depending on the download speed of my players I either create the whole thing outside and just upload one big JPG or have all the pieces in Roll20 and assemble it there. I prefer the latter as changes to layout can be done more quickly. These pages can become quiet elaborate as I have shown here. This time I made something a bit simpler for a one shot. 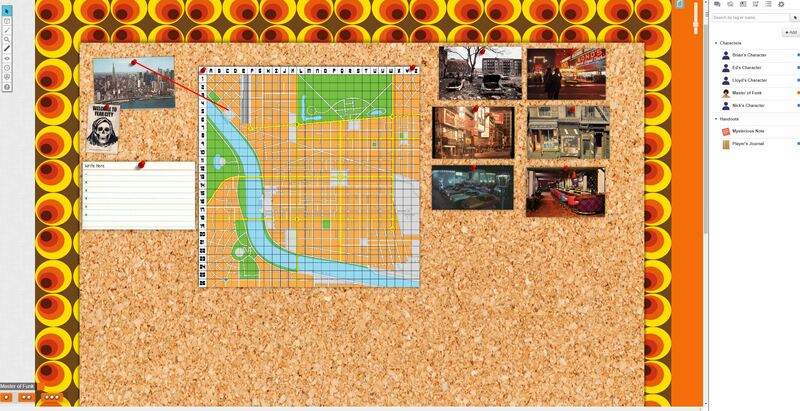 The plan here is to use the card(s) for notes and have the photos link to locations on the map as the game develops. If a game requires Maps this is a necessary step. I love all the fancy bells and whistles that Roll20 has, so Line of Sight is a must in my opinion if you want to play a dungeon crawl of any kind. The effect is awesome, but it needs a bit more set up time for the tokens as well. You can read instructions on how to do that here. In general read a bunch of different tutorials and videos on map setup in Roll20 before you do this step. It can save you a lot of frustration and time! The Roll20 shop also has a ton of ready to go stuff that will cost you money but again save time and hassle. In most of my games I don`t even bother to do Battlemaps anymore as I don`t feel they are necessary all the time. But they can elevate your game immensely if you like to have tactical miniatures combat. When I wing it I usually do not prepare any monsters or NPC. But I do prepare a bunch of fitting tokens/portraits. As I never know what may come up I rather be safe then sorry. I run several Pinterest walls for various games where I pin stuff when I come across it. Another good source for character images is Deviantart. When it is time to prep the game I first create a template in Gimp and then simply en masse push out the images. It took me 90 Minutes to create the below, but I had to do some searching as well as finding even remotely fitting 70s illustrations is hard! I settled to add some fashion catalog images as sources in addition to illustrations. I ran the former through Fotosketcher to give them a more painted look. Make sure to sort everything in sub folders in your library or you will never find your way around various games. Since the addition of Tabletop Audio there are some fantastic tracks for background music. I don`t overdo it but a handful of genre appropriate tracks are good to sprinkle in here and there. I tend to use Goole+ for everything so I also use their calendar. They make it not easy to use this stuff right now as they are messing with things constantly but so far it still works. I do not use the Roll20 Video as I find the quality lacking and always have trouble to get it to work for everyone. Google Hangouts are much more reliable in my opinion and that is why we still use it. Others use Skype or Discord or any other voice/video app. And after all that we finally can spend time playing games. I tend to spend more time on “visual” prep then many others because I am a very visual person myself and doing these things helps me get into the game. Others with more imagination get away with far less work. And of course all that stuff is fun for me to do as well. Experiment with a process that works for you and focus on the things that are either fun to do or things you know you will struggle with. If you have any specific questions about my process or things you want to know more about, please let me know in the comments!